A Mail eXchange record is an entry in a domain name database that specifies a mail server to handle a domain name's email. We would make a change to this record in the event where you wanted to manage your emails yourself through your own mail exchange server. The time you would like the change to occur. The change will not take place immediately, so it is suggested you do it during a time when you are not expecting emails. Q: How do I view my emails? You can access your webmail by going directly to http://webmail.yourdomain.com, where "yourdomain.com" is the main domain name you are using for your website. On the following screen you will be prompted to enter your email address as the username and yourpassword. Q: How do I create a new email address? Click on "Settings" on the left, then on the "Emails" tab. In the "Add New Email Address" form, fill in the fields and click on "Add Email"
Q: What are the guidelines & restrictions when sending emails? If we leave the mail network unrestricted, computers infected with viruses, Trojans and worms can wreak havoc and cause severe congestion, which means slower internet and email for everyone. It's for this reason, and because sending spam is prohibited under Canadian law, that we have limits around email use. Viruses, Trojans and worms can turn unsuspecting users into spammers without them even knowing an infected computer is capable of sending tens of thousands of emails per day. Not only can this slow down the network, all the additional usage that's being consumed can rack up hefty additional usage bills for the victim. In addition, we prohibit the sending of spam in our Terms and Conditions, but unfortunately there are still those who choose not to comply. Restrictions help control offenders before they too have an effect on the service of all other users. Generally, users can't send more than 30 emails in 10 minutes. A total email mustn't exceed 20MB in size to be successfully sent or retrieved over the mail network that includes attachments, header information and the body of the email. If you're the primary user on your account, managing any Additional Users is your responsibility. Support is not involved in managing or administration of your additional users (or their passwords). 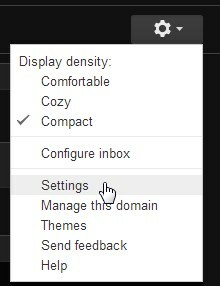 Click on the "Settings" tab on the left and the on the "Emails" tab at the top. Click on the radio button next to the email address you want to setup the autoresponder for, and then click on the "Set Auto-Response" button. Fill in the following fields and click on "Save Auto-repsonse"
Enable Auto-Response - This box needs to be ticked for the autoreponse to start working. This allows you to save your autoresponse for next time by just unticking the box. Response Email Message - The message that will be placed in the body of the email. Q: How do I create an email alias? An email alias is not a real email account, instead it is an address that forwards all the email it receives to another account. If you want to still access the email account like a normal account, you could try setting up an email forwarder. Click on the radio button next to the email address you want to setup the alias for and click on the "Manage Email Aliases" button. Fill in the "Email Alias" field with the email you want and click on "Add Alias". This email address must have the same domain as the one you are using. 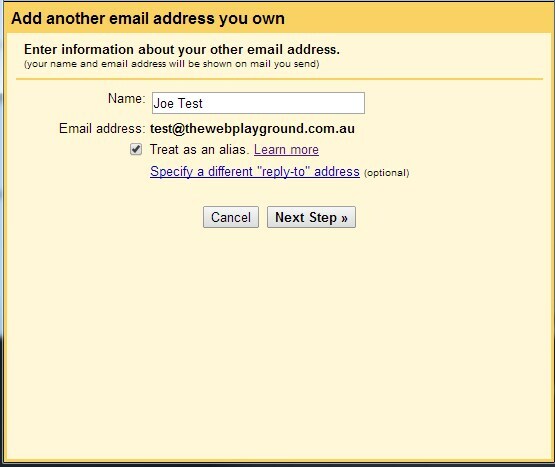 Eg: for the email test@thewebconsole.com, you could setup tst@thewebconsole.com but not test@test.com. There is a feature within Google Apps that allows you to add a random quote to to the end of your email signature. This is a very good promotional opportunity for businesses - announce a new product, share a special offer, promote your USP etc. Note - Labs are add-ons created by Google users and are not permanent features of the system. This means there might be bugs with them or they might stop working all of a sudden. They are safe to use but please be aware we cannot help you if the lab you are using goes down. Q: How do I forward and email? A forwarder is an email program that forwards any emails sent to a certain address onto another email address. It is used when an individual may have a few email accounts setup, eg: admin and accounts and wants them sent to the same person. Click on the radio button next to the email address you want to setup the forwarder for, and then click on the "Setup Forwarders" button. Type the address you want to add into the "forward to email" text field. You can forward the email to multiple accounts by clicking on "Add Another". Once you have entered in the email accounts, click on "Save Forwarders"
Click on the radio button next to the email address you want to modify and click "Edit"
Untick the "Save a copy" tick box and click "Save Email"
Q: How do I connect an email address to a Gmail account? 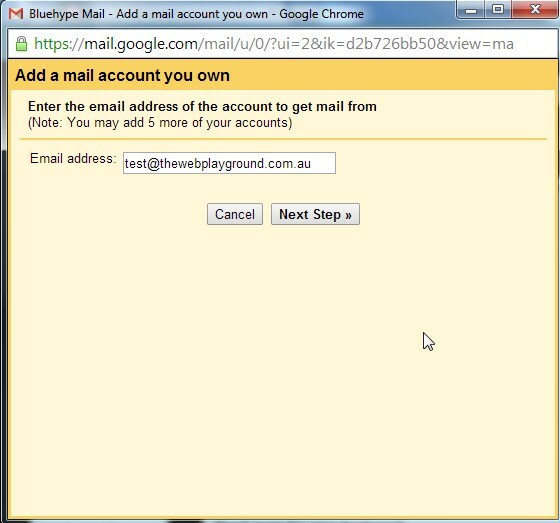 You are able to connect your email address to a Gmail account, below are the steps to take to acheive this. Log into your Gmail account. Click on the "Settings Cog" in the upper-right corner of the screen and go to Settings. On the settings page click on the Accounts heading. 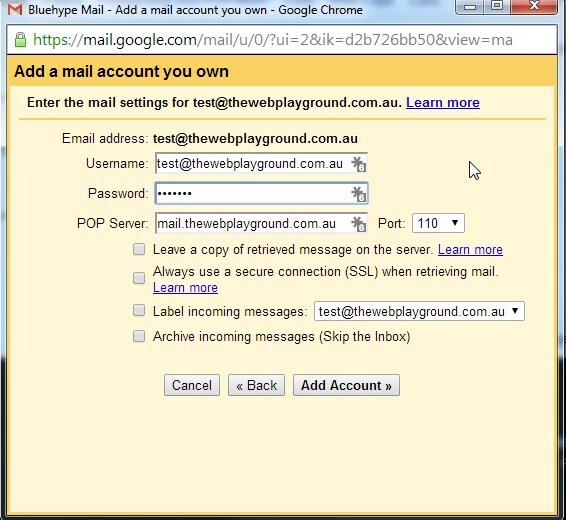 Go to Check mail from other accounts (using POP3) and click on the link Add a POP3 mail account you own. Once you click on the Add a POP3 mail account you own a popup box will appear where you will add the email address of the account to get mail from. Username: This is the email address. Password: This is the password of the email address. POP Server and Port number: Leave this as the default values already there. If there happens to be no entries the POP Sever will be mail. [domain name] and the Port 110. This is shown in the image below. 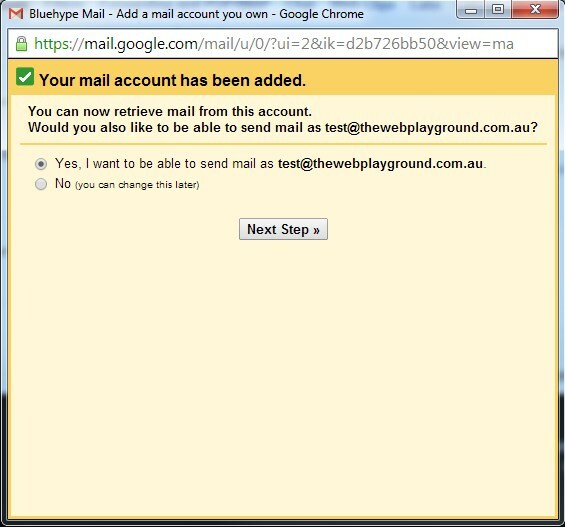 Tick box option Leave a copy of retrieved message on the server: Leave this unticked as you want Gmail to delete the email of the webmail server once the email has been downloaded to Gmail. This will not delete the email out of Gmail. Always use a secure connection (SSL) when retrieving mail: Leave this unticked we do not need to use an SSL connection. Label incoming messages: If you have created labels within the Gmail account you can assign a label to the emails that come through from the account. This can be useful if you have multiple email accounts connecting to your Gmail account. Leave this unticked if you don't want any labels connected to the emails. Archive incoming massages (Skip the Inbox): If this is ticked all your emails will go to archive instead of going into the inbox. Once this is done click on Add Account. The account will now be added to Gmail. If you want to be able to send emails as the email address select yes and click on Next Step. Add your name and select whether you want to treat the email address as an alias. You can learn more about this feature from the link in the box. 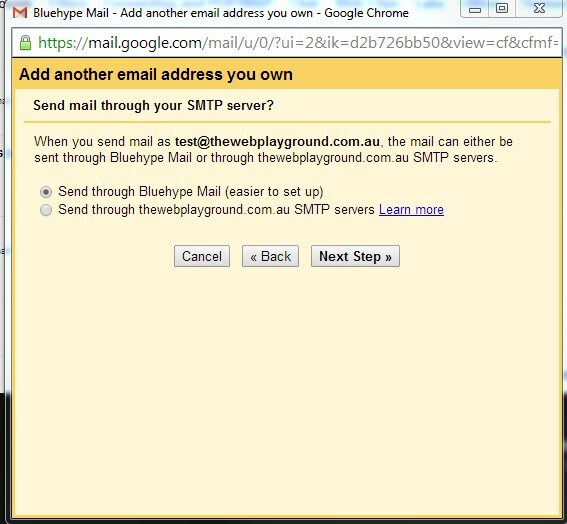 Send the mail through the gmail servers which is the first option and click Next. 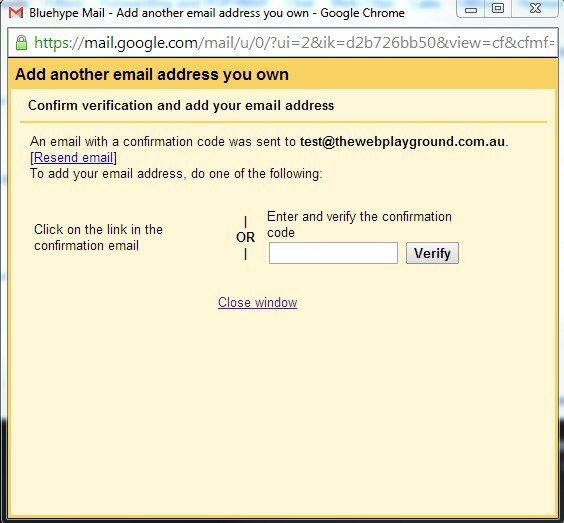 A verification email is sent to the email address with a way to verify that you have control of the email address. Click on the Send Verification button and then log into webmail of your email address to view the email. The email will have a verification code with numbers. Add the verification code to the text box and that is it.